Vietnam, therefore, needs complete mechanisms on dredging and waste dumping activities to protect the environment, experts recommend. Nguyen Van Can, head of Hai Phong city’s Agency of Seas and Islands, said provincial and city authorities should hold the power to issue waste dumping permits. Hai Phong has about 3 million cu.m of dredged waste waiting for dumping and city authorities want to dump it inland. Ta Dinh Thi, head of the Vietnam Administration of Seas and Islands (VASI) also stressed the need to revise Decree 51 on dumping permits. However, according to Nguyen Thanh Tung, head of the Policy and Legal Department under VASI, there is a lack of regulations regarding waste dumping, sea encroachment and sea environment monitoring. Additionally, some regulations on coastal protection corridor, certification of dumping permits and high risk areas for sea environmental pollution have legalized for the first time, creating disputes when implemented. VASI worked with other agencies to develop the 2015 Law on Sea and Island Natural Resources which regulates dumping processes, waste permitted to be dumped and the responsibilities of organizations and individuals in charge of disposal. According to Tung, Vietnam’s regulations on sea disposal of dredged materials and waste follow the London Convention on the prevention of marine pollution by dumping of wastes and other matters. 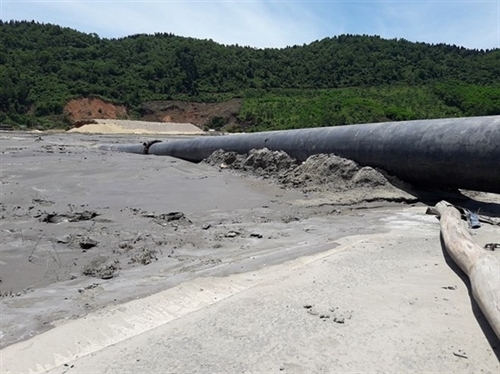 Early this month, Thua Thien - Hue province refused a request from Hao Hung Hue Company - the Chan May Port project investor - to dump 700,000cu.m of mud waste 3km offshore.